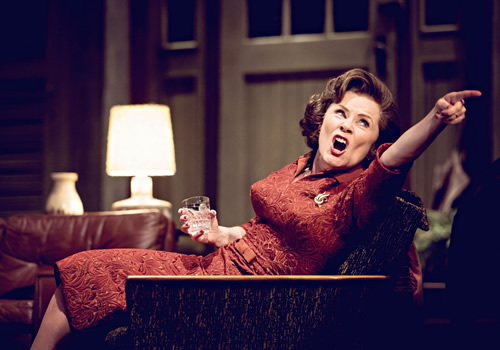 Legendary actress Imelda Staunton stars in a new production of Tony and Pulitzer Price-winning playwright Edward Albee’s landmark play Who’s Afraid of Virginia Woolf? 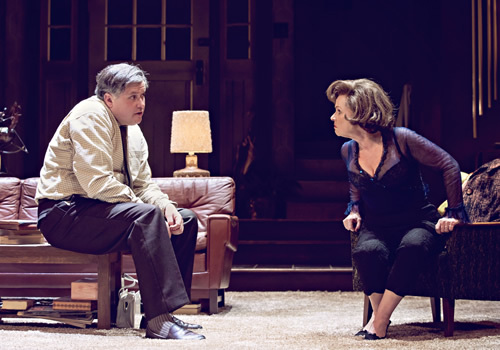 Directed by James Macdonald (The Father), Staunton stars alongside Conleth Hill in the five-star production that plays at the West End’s Harold Pinter Theatre. 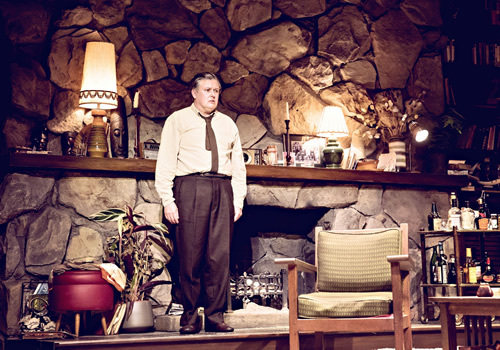 Albee’s acclaimed play takes place in the early hours of a morning on the campus of an American college. Much to her husband George’s dismay, Martha has invited new professor Nick and his timid wife Honey round for an after-hours gathering. As the drink flows and dawn approaches, the young and unknowing couple are drawn into George and Martha’s toxic games until the even reaches a devastating climax. After a triumphant, Olivier Award-winning performance in Gypsy, Imelda Staunton returns to the West End to play the malicious Martha, alongside Game of Thrones’ Conleth Hill as George. Staunton has numerous theatre credits to her name, including her Olivier Award-winning role as Mrs Lovett in Sweeney Todd, as well as A Delicate Balance and Good People. Her film credits include the notorious Dolores Umbridge in Harry Potter, as well as her BAFTA-winning role in Vera Drake. Olivier Award-winning actor Hill is best-known for his role as Lord Varys in HBO’s Game of Thrones, with recent theatre credits including Quartermaine’s Terms and The Producers. 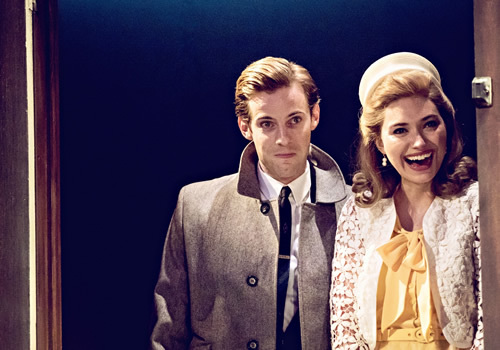 Further casting includes Imogen Poots (28 Weeks Later) making her West End debut as Honey and Luke Treadaway (The Curious Incident of the Dog in the Night-Time) as Nick. James Macdonald directs, following his recent highly regarded Escaped Alone at the Royal Court, as well as Florian Zeller’s The Father. 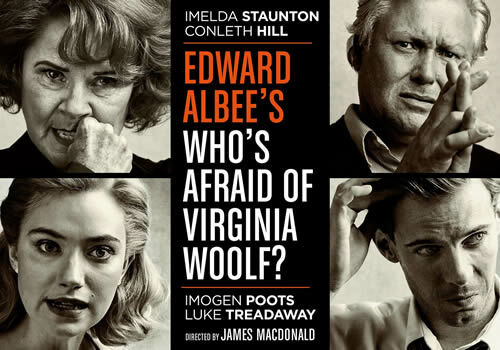 Playing at London’s Harold Pinter Theatre since March 2017, Who’s Afraid of Virginia Woolf? continues to wow audiences, earning five stars from audiences and critics alike. Who’s Afraid of Virginia Woolf? may not be suitable for young children. Click here for the Harold Pinter Theatre seating chart and seat price guide.